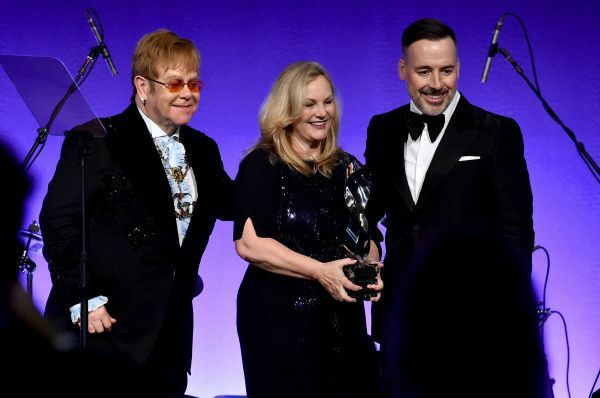 Ford Foundation’s Darren Walker, philanthropist Patricia Hearst, and DDG’s Joe McMillan were honoured at the Elton John AIDS Foundation’s 2018 New York Fall Gala, raising $3.9 million to support the Foundation’s global efforts. 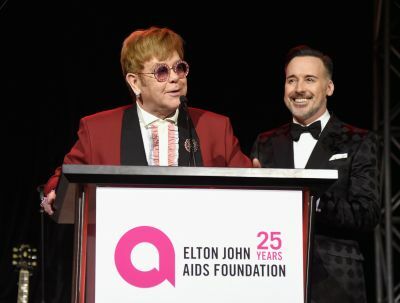 Last night, Monday, November 5, 2018, the Elton John AIDS Foundation (EJAF) raised $3.9 million at its 2018 annual New York Fall Gala to support HIV/AIDS prevention, treatment, supporting services, and advocacy programs across the globe. American Airlines, BVLGARI, Robert K. Kraft, the Leonard and Judy Lauder Fund, and Patricia Hearst served as Presenting Sponsors of the benefit. The star-studded evening was held at Cipriani 42nd Street in New York City. 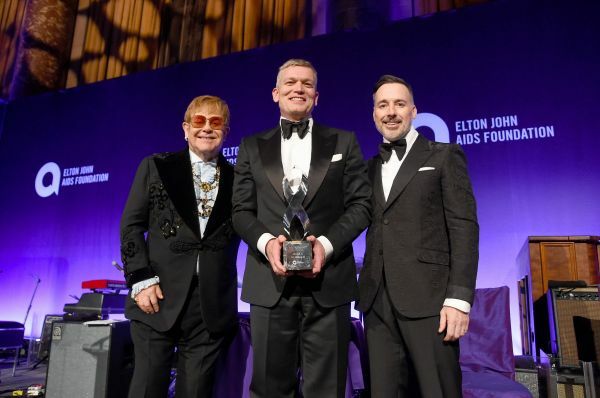 As part of the evening’s program, EJAF recognized the exceptional contributions of three individuals, presenting each of them with the Foundation’s Enduring Vision Award, which was donated and designed by BVLGARI in collaboration with London-based designer duo Campbell-Rey. Darren Walker, President of the Ford Foundation—one of the world’s largest and most important philanthropies—was lauded as a philanthropic leader who has dedicated his life to addressing the pervasive inequality that impacts people across our society, including those affected by HIV/AIDS. 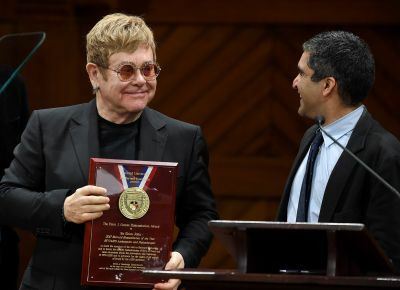 EJAF also recognized the critical support and ongoing partnership of the Ford Foundation. Noted philanthropist Patricia Hearst was honoured for her long-term support of EJAF’s lifesaving mission, which has endured for more than fifteen years. Joe McMillan, chairman and CEO of DDG, was recognized for donating his time, talent, and resources as part of his abiding commitment to the Foundation’s cause. CBS This Morning co-anchor and journalist Gayle King hosted the event. Bryan Stevenson, Founder and Executive Director of the Equal Justice Initiative and the new National Memorial for Peace and Justice in Montgomery, Alabama, was the guest speaker. 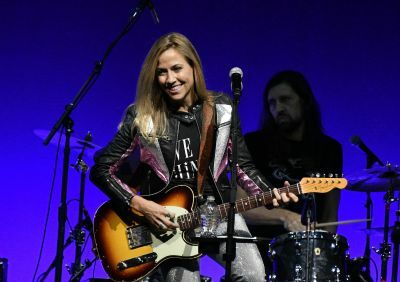 The evening closed with a special concert performance by multi-Grammy Award winner Sheryl Crow. During the evening, guest auctioneer Alexander Berggruen of Christie’s conducted a live auction featuring such one-of-a-kind items as the BVLGARI Serpenti Seduttori necklace, Chris Levine's lightbox artwork of Her Majesty the Queen entitled "Equanimity,” Photographs of Billie Jean King from the recent and now iconic Adidas ads along with seats at her US Open suite, a David LaChappelle photograph of Elton John called Honky Cat from the artwork for the Farewell Yellow Brick Road tour, a photograph by Greg Gorman of Michael Jackson, Tony Bennett's watercolor painting of the French Academy in Rome, Andy Warhol's stitched photograph of metal chairs donated from the personal collection of art world luminaries Shelly and Vincent Fremont, and a series of 12 prints by Bernie Taupin created to recognize his 50 year collaboration with Elton John, each print having been signed by Elton John and Bernie Taupin. 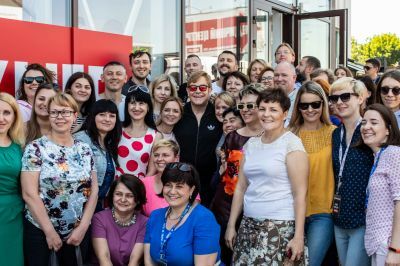 Through the impeccable credibility and reputation attained based on more than 25 years of extensive work, EJAF has emerged as a significant leader in the field of HIV/AIDS. The Foundation advances public dialogue on critical and controversial issues related to the epidemic and challenges misguided policies and attitudes that block progress toward ending the epidemic. Proceeds from the New York Fall Gala will help support these efforts, as well as EJAF’s grant-making initiatives around the world.